Decorating a studio apartment can be tricky business. Wall space, floor space and counter space are all at a premium, so every choice you make has to be deliberate and impactful. It’s all too easy to cross the line from ‘cozy’ to ‘cluttered’ with such a small area to decorate. So how do you furnish your small living space in a way that shows off your unique style while ensuring your studio is functional and uncluttered? 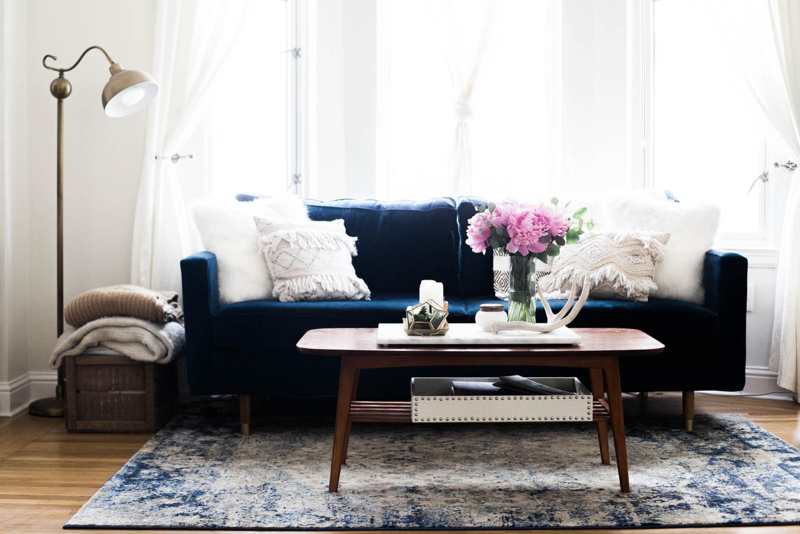 We’ve compiled some of the best tips to guide you in the right direction, based on some of the most common points of concern when addressing how to decorate a studio apartment on a budget. What’s one of the most important questions when it comes to furnishing your studio according to some of our residents at McKinley Apartments? Choosing the right furniture. Enormous mega-sectionals might be out of the question, but you still want usable, stylish furniture to create that home feel. Are you flying solo in your studio, or do you live with a partner or roommate? Start with the minimum amount of seating you’ll need so that you can both sit together at a given time. From there, take a real look at what level of entertaining you do (or expect to do) in the space. Accept that having enough seating for a 15-person house party might be outside the scope of your space. In general, we recommend a small sofa that can fit two people comfortably and three in a pinch, an additional small-but-stylish chair (preferably armless) for extra seating, and a small bistro-style table with two foldable chairs for dining. Additional folding chairs can be stored out of sight when not in use and brought out when you have guests. Be as realistic as possible when it comes to decorating a studio apartment on a budget. It’s easy to think, ‘The more seating, the better.’ But bumping into chairs and table edges as you try to make your way through a space will soon become frustrating enough to make you rethink that approach. 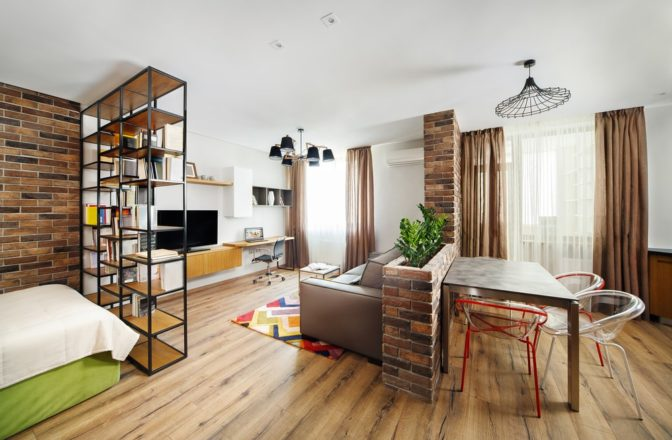 As studio apartment living becomes increasingly common, more and more companies are coming up with innovative products that help you achieve large-home living in a tiny space. Don’t be afraid to try unique furnishing approaches that you’re more traditionally-minded friends or family members might not recognize. 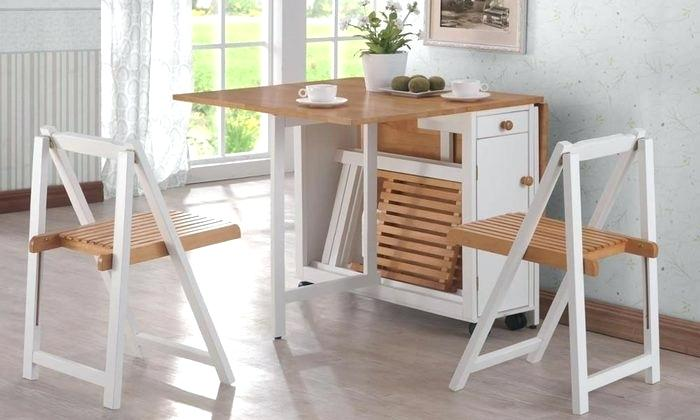 There are now several designers selling tables that fold up flat against the wall when not in use, but which can be instantly folded out for a large dining space. In fact, there are even studio-designed bed frames that do the same thing—fold up flat against a wall during the day and fold down easily for sleep. And we know what you’re thinking—no one wants to stare at the bottom of a bed frame as wall décor. But many of these designs fold the bed up into a stylish, cabinet-style hiding place for form and function in equal measure. These are a few suggestions, but finding ways to adapt furniture to work for your space is all about creativity. Don’t be afraid to look at common furniture items in new ways. Movable, hollow squares can function as seating, tabletops, or storage depending on your needs at a given time. The more uses you can get out of each piece of furniture, the less furniture items you’ll have filling up your limited space. Hanging mirrors has been a common method for making a space feel larger and lighter for years, and we love this method at McKinley Apartments. It expands the visual space of your home in an almost magical way, allowing you to look past walls and helping to make your home feel more open and airy. 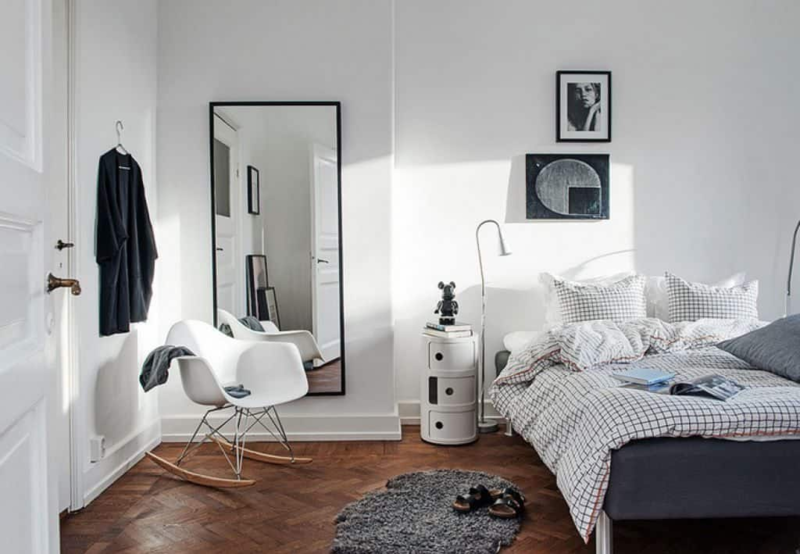 Studio apartments can also be notoriously low on natural light, another area where mirrors can be a big help. Reflecting light around the room can upgrade the bright, cheery feel of your studio in an impactful way. It’s incredibly easy to make a studio apartment feel cluttered. With just a single open space, you don’t have the option to shove laundry or messes into a bedroom whenever guests arrive. That makes finding solutions for avoiding clutter absolutely essential. With that in mind, hidden storage is your best friend. There are all sorts of products dedicated to maximizing every inch of hidden space in your closets and drawers, from soft and foldable hanging shelves to wall hooks and racks. Keeping car keys, wallets, cables, snacks, or other items out in the open will make your small home feel messy faster than you think. But avoiding clutter in a studio is about more than just adding hidden storage. You might need to adopt a bit of a less-is-more mindset, asking yourself before each purchase whether you really need that third floor lamp or potted plant. The more items are scattered around your studio, the less usable space you have available. This is related to avoiding clutter, but is important enough to warrant its own section. In an open studio space, your kitchen counter should not be a depository of everything you pull out of your pockets or want close at hand. If you really want your daily items within grabbing distance, find an opaque storage container with an easily removable lid and keep those items there. You’ll thank yourself later when your studio apartment retains a sense of clean, uncluttered peace. One of the greatest struggles that studio living presents is keeping your living space and sleeping space separate. Not only can entertaining guests around a large bed in the middle of the apartment feel strange, but sleeping where you were having a dinner party moments earlier can sometimes be off-putting. We recommend positioning your bed in a corner of the studio, and using a relatively inexpensive partitioning method to separate it off from the rest of the space. This will give the added benefit of some privacy in the area where you sleep. Bookshelves that are open on both sides work great for this, because they also offer the opportunity to display decorations or keep personal items close at hand. They also create a sense of separation while allowing the eye to pass beyond them, keeping your studio apartment from feeling small. 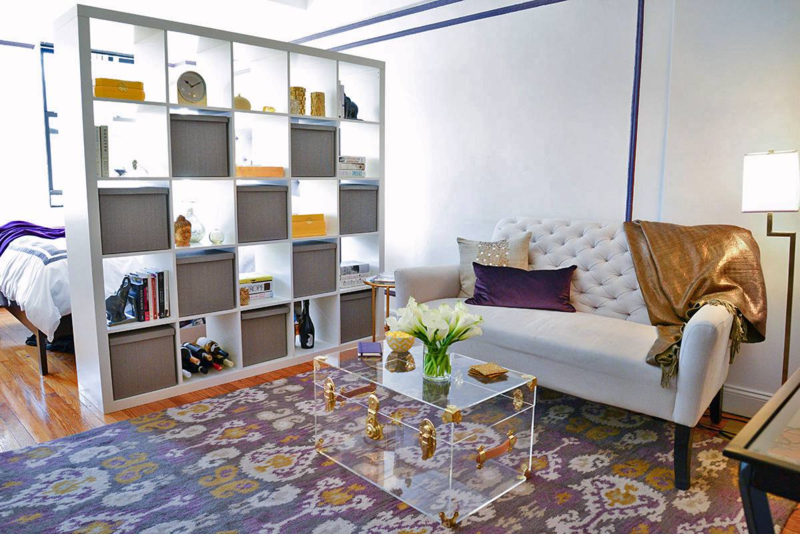 On a related note, you can create designated spaces very easily with the power of a few well-placed rugs. A small rug placed under your coffee table and sofa, for example, can make your ‘living room’ area feel like its own unique space. The same can be done for your ‘bedroom’ or dining area. We recommend subtly patterned rugs in shades on the lighter side of the color spectrum. 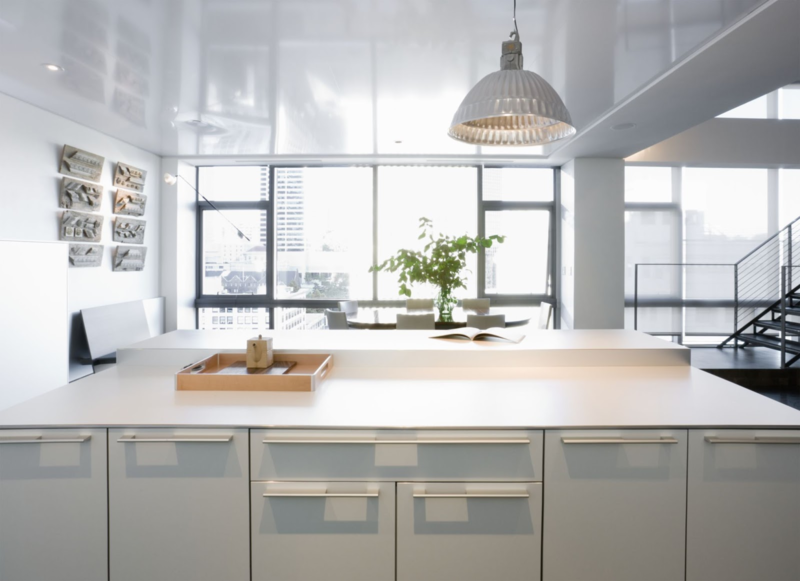 Off-white and light creams do a great job of separating spaces without making the space feel stuffy or cluttered. Overall, your studio apartment is your unique space. 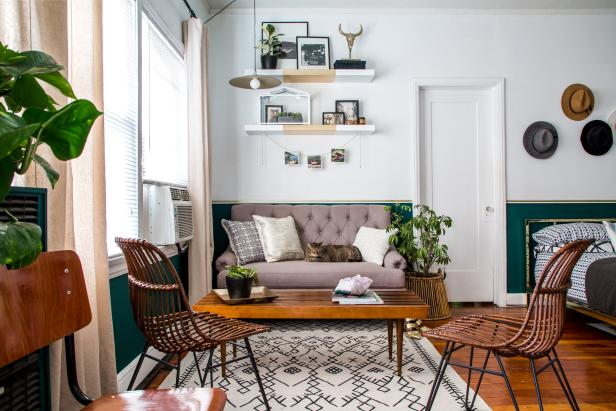 These tips for studio apartment decorating ideas on a budget are by no means designed to tell you how you should decorate or the right way to furnish your home. 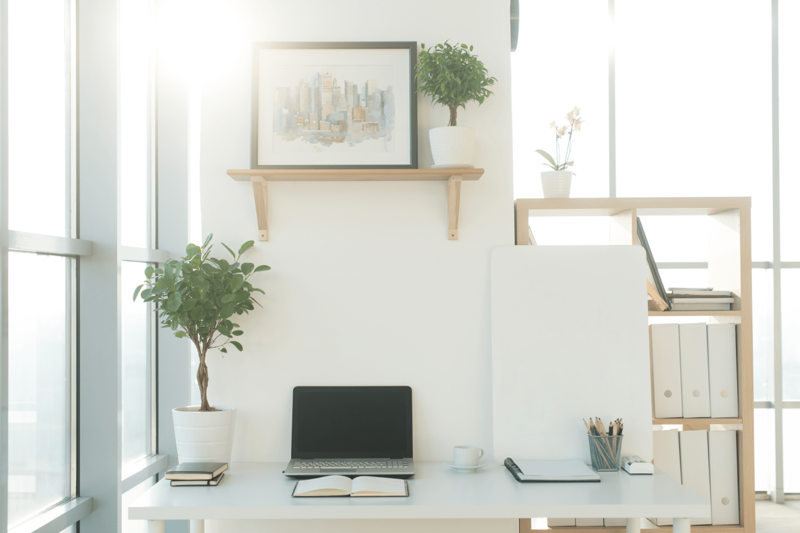 But living in a studio is all about making the space work for you, and if you follow some of these tips you’ll find your studio apartment decor every bit as enjoyable, relaxed and stylish as some much larger spaces. And if you’re still on the lookout for the apartment itself, McKinley Apartments can help. Don’t worry about your decor: check out our modern studio now!